We sat face to face on the couch talking about what is “next” for me. To date I have had two separate and very rewarding careers. I have seen parts of this world I never dreamed possible. Nearly 10 years ago, I stepped back from it all. Laid down one enterprise to pick up another adventure: Raising our daughter. And, supporting my husband’s path and the journey it has taken us all on. He proposes ideas. Solutions. Me? I put up roadblocks. Speak only of excuses. Back and forth we go. Both hoping for resolution. Yet none ever reached. Complacency can derail a dream before it has the ability to gain momentum. During the silence within my next few days, I began to dig deep inside. Studying myself. Both versions — the once upon a time professional and the current mommy homemaker. What I unearthed was quite emancipating, but not easy to admit. So here goes. I am in a rut called self-complacency. Yuck! What a horrible word. Complacency can occur when one is comfortable. Feeling secure. What we strive for, correct? Well, what I have learned is that that security can actually hold you back. Paralyzing along the way. Progress standing still. Growth lying dormant. We still sit face to face every evening discussing what is next for me, but I feel freer now having been so brutally honest with myself and now you, my audience. The soul-searching session I had with myself made me wonder how you may be feeling. So my question to you, the dancer, is this: Are you allowing complacency to creep into the work you are trying to achieve in the studio? 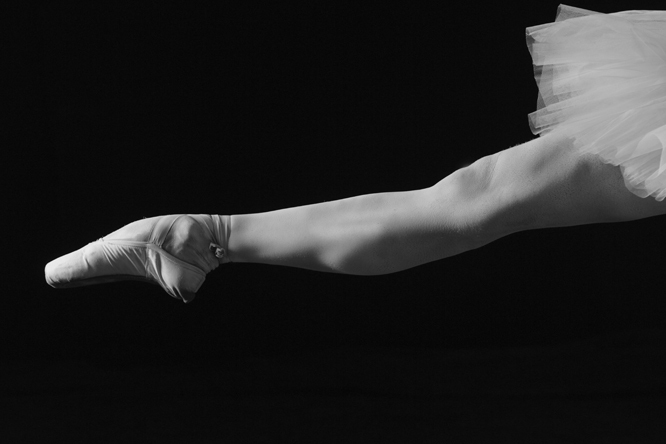 Is a tendu just a tendu or is it a deliberate movement of the leg with a perfectly shaped foot? If you, too, are sensing complacency, join me as we reflect, recommit and find our purpose again! Ballet should never be nor feel comfortable. I suppose that could be your first clue that you have become unconcerned with growth. Explore the reasons why. Has the safety and ease of your daily approach gotten you thinking that status quo is okay? Are you making excuse after excuse out of fear of change? Remember to improve requires change. Sadly change is what we become resistant to. We should never be satisfied by anything ordinary. So be brave. Embrace change — a change in outlook. A change in your awareness. A change in your approach. Or, maybe even change in your environment. Complacent behaviors can become ingrained habits that you eventually won’t be proud of. Not to mention zapping your motivation and sucking your energy and spirit dry. Complacency can derail a dream before it has the ability to gain momentum. We cannot have that happening. We hear the word goals a lot. Gotten kind of generic in my mind. I prefer to think, “What will I do today that is different, even better, than that of what I did yesterday?” This works like simple little building blocks getting to where I want to be (aka, the goal). Keep your steps small for feelings of attainment. Visualization is paramount, I am a key believer. Used to use it prior to stepping onto the stage. See yourself making the change. Believe you can do it. If need be, write it down. Post it somewhere and reacquaint yourself often. Share your plans with those who will lift you up when your own self-motivation falls short. Lastly, remember that your actions and efforts directly affect any and all opportunity you will ever receive. So now we begin our uphill trek out of this transitory slump! Great article! Complacency can infiltrate people’s lives, no matter what their walk in life is. I’ve learned that if I can practice shaking complacency off when it comes to my tendus, It becomes much easier to shake it off in other areas of my life too!